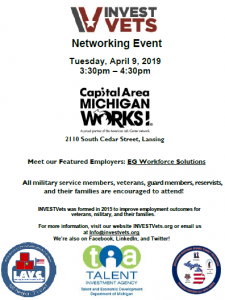 Capital Area Michigan Works, 2110 S. Cedar St.
Meet with EG Workforce Solutions. Get help with your job search. All military service members, veterans, guard members, reservists, and their families are encouraged to attend!